Christine McVie is like the forgotten middle child of Fleetwood Mac. Drummer Mick Fleetwood and bassist John McVie preceded her when they founded the band in 1967, and frontwoman Stevie Nicks and lead guitarist Lindsey Buckingham followed her when they joined in 1974. Given the group’s rise to fame after Buckingham and Nicks joined, it’s assumed they are the the primary creative force behind the band’s timeless catalogue. 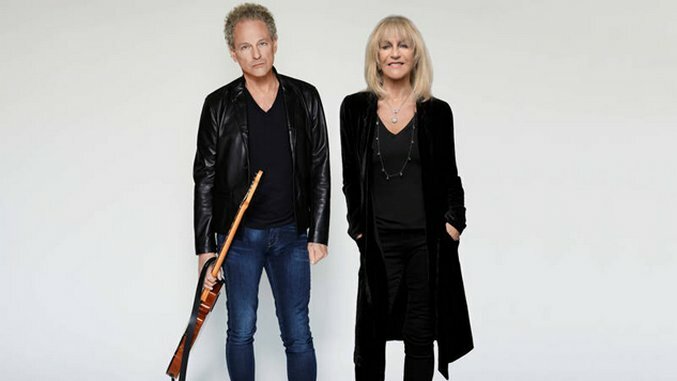 So the new album by the duo of Christine McVie and Buckingham seems curious to many (although we thought it was quite good; read our review here). But when you realize that McVie and Buckingham made it through rock’s greatest cocaine-fueled soap opera without any reported ill-will, it actually makes perfect sense. Plus the pair—and especially McVie—wrote the majority of the group’s major hits. So the duo’s upcoming tour offers an opportunity to hear Fleetwood Mac’s songs in a more intimate setting, and the album, released today, marks the first time since 1987 that these two great songwriters have collaborated in the studio. There are so many great Buckingham/McVie songs, in fact, that you could compile an entire classic Fleetwood Mac album just from the best tunes credited to one or the other of them. So in honor of these musicians’s new self-titled collaborative album, we’ve compiled the 10 best songs they’ve written. The result is the ideal Fleetwood Mac greatest-hits album you want to hear on the McVie/Buckingham tour. This soft-rock hook was written by McVie and sung by McVie and Buckingham. The silly desert video shoot was reportedly not so silly: Nicks was furious with Fleetwood for having an affair with her best friend that broke up her best friend’s marriage, all while Buckingham and Nicks were far from over their own breakup. But there were apparently no problems between McVie and Buckingham. This cut from his 1992 solo record Out of the Cradle was one of Buckingham’s better vocals—though few bands have a trio of singers as distinctive as Fleetwood Mac’s. With McVie back in the picture, “Countdown” would work well on this tour, especially since it’s one of rare times the brooding Buckingham has ventured into optimism. The B-side to “Dreams,” McVie’s “Songbird,” with its lyrics of self-sacrifice (and perhaps just its sheer beauty), reportedly kept the band together when they were on the verge of breaking up during the “Rumours” sessions. A longtime show-closer for Fleetwood Mac, it’s the perfect vehicle for McVie’s graceful piano and unique alto. Another production tour-de-force by Buckingham, this Tango in the Night track is guaranteed to be a part of the tour with McVie. Perhaps no Fleetwood Mac song does more to showcase his virtuosity on guitar. Plus, it’s said “Big Love” is one of Buckingham’s personal favorite. The fourth Top 10 hit from Rumours, “You Make Loving Fun” finally shows some unquestionable joy in its lyrics and sound—which has a classic-’70s funk vibe courtesy of McVie’s keyboards and Buckingham’s lead guitar. But there’s no happy ending here, as it outed McVie’s affair with the lighting director, which got the man fired. It seemed crazy at the time to pivot so hard from “Rumours,” but this Buckingham song from 1979’s Tusk has aged remarkably well. Since the percussion is its trademark, it’s fascinating to discover it was written by Buckingham about the secret affair drummer Mick Fleetwood was having with Nicks. “Say You Love Me” showcases more top pop craftsmanship from McVie and great playing by Buckingham. There are two versions of this song, with the single featuring Buckingham adding more of his guitar to the mix. “Say You Love Me” is an illustration of why Buckingham, in addition to being one of rock’s most underrated guitar players, may be its most underrated producer, too. It comes as no surprise that Buckingham’s two biggest influences were Brian Wilson and Phil Spector. Fleetwood Mac is really a “wall of sound” band, and you can hear it here, especially in the chorus. There’s also a typically tight Buckingham solo. But this is a straight breakup song, and forcing Nicks to hear the lines “packing up, shacking up is all you wanna do” not only on the radio but repeatedly in concert seems cruel even today. “Every time those words would come onstage, I wanted to go over and kill him,” she told Rolling Stone. One of Fleetwood Mac’s most beloved songs, “Don’t Stop” peaked at No. 3 on the U.S. charts. This McVie anthem is ostensibly optimistic (it worked for Bill Clinton! ), but eradicating your past while thinking relentlessly about the future may not actually be the best prescription for happiness. There’s no denying its uplifting flow nor the simplicity of its structure, the marriage of which is McVie’s signature sound.